After the changes made in jQuery 1.6.1, I have been trying to define the difference between properties and attributes in HTML. Properties: All which either has a boolean value or that is UA calculated such as selectedIndex. Attributes: 'Attributes' that can be added to a HTML element which is neither boolean nor containing a UA generated value. When writing HTML source code, you can define attributes on your HTML elements. 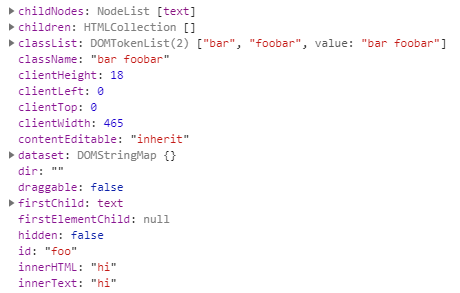 Then, once the browser parses your code, a corresponding DOM node will be created. This node is an object, and therefore it has properties. has 2 attributes (type and value). Once the browser parses this code, a HTMLInputElement object will be created, and this object will contain dozens of properties like: accept, accessKey, align, alt, attributes, autofocus, baseURI, checked, childElementCount, childNodes, children, classList, className, clientHeight, etc. For a given DOM node object, properties are the properties of that object, and attributes are the elements of the attributes property of that object. The id property is a reflected property for the id attribute: Getting the property reads the attribute value, and setting the property writes the attribute value. id is a pure reflected property, it doesn't modify or limit the value. The type property is a reflected property for the type attribute: Getting the property reads the attribute value, and setting the property writes the attribute value. type isn't a pure reflected property because it's limited to known values (e.g., the valid types of an input). If you had <input type="foo">, then theInput.getAttribute("type") gives you "foo" but theInput.type gives you "text". There are several properties that directly reflect their attribute (rel, id), some are direct reflections with slightly-different names (htmlFor reflects the for attribute, className reflects the class attribute), many that reflect their attribute but with restrictions/modifications (src, href, disabled, multiple), and so on. The spec covers the various kinds of reflection. The answers already explain how attributes and properties are handled differently, but I really would like to point out how totally insane this is. Even if it is to some extent the spec. It is absolutely essential, that two input fields, e.g. a text and a checkbox behave the very same way. If the text input field does not retain a separate "when it was loaded" value and the "current, dynamic" value, why does the checkbox? If the checkbox does have two values for the checked attribute, why does it not have two for its class and id attributes? If you expect to change the value of a text *input* field, and you expect the DOM (i.e. the "serialized representation") to change, and reflect this change, why on earth would you not expect the same from an input field of type checkbox on the checked attribute? The differentiation, of "it is a boolean attribute" just does not make any sense to me, or is, at least not a sufficient reason for this. The .prop() method should be used for boolean attributes/properties and for properties which do not exist in html (such as window.location). All other attributes (ones you can see in the html) can and should continue to be manipulated with the .attr() method. After reading Sime Vidas's answer, I searched more and found a very straight-forward and easy-to-understand explanation in the angular docs. Attributes are defined by HTML. Properties are defined by the DOM (Document Object Model). A few HTML attributes have 1:1 mapping to properties. id is one example. Some HTML attributes don't have corresponding properties. colspan is one example. Some DOM properties don't have corresponding attributes. textContent is one example. Many HTML attributes appear to map to properties ... but not in the way you might think! Attributes initialize DOM properties and then they are done. Property values can change; attribute values can't. For example, when the browser renders <input type="text" value="Bob">, it creates a corresponding DOM node with a value property initialized to "Bob". When the user enters "Sally" into the input box, the DOM element value property becomes "Sally". But the HTML value attribute remains unchanged as you discover if you ask the input element about that attribute: input.getAttribute('value') returns "Bob". The HTML attribute value specifies the initial value; the DOM value property is the current value. The disabled attribute is another peculiar example. A button's disabled property is false by default so the button is enabled. When you add the disabled attribute, its presence alone initializes the button's disabled property to true so the button is disabled. Adding and removing the disabled attribute disables and enables the button. The value of the attribute is irrelevant, which is why you cannot enable a button by writing <button disabled="false">Still Disabled</button>. Setting the button's disabled property disables or enables the button. The value of the property matters. The HTML attribute and the DOM property are not the same thing, even when they have the same name. Attributes are referring to additional information of an object. Properties are describing the characteristics of an object. Attributes are additional information which we can put in the HTML to initialize certain DOM properties. It is also important to realize that the mapping of these properties is not 1 to 1. In other words, not every attribute which we give on an HTML element will have a similar named DOM property. Furthermore have different DOM elements different properties. For example, an <input> element has a value property which is not present on a <div> property. We can see that the class attribute in the HTML has no corresponding class property (class is reserved keyword in JS). But actually 2 properties, classList and className. What is the difference between attributes and properties when using in Jquery? getAttribute() versus Element object properties?